ID Cards Maker (Corporate Edition) allows you to design custom style ID Cards for Employees, Students, Visitors and many more. Software provides facility to design and print professional looking ID Cards of group of people simultaneously using Excel data file. You can also add photo on your ID Card by capturing an image using Camera setting option. Corporate Edition of ID Card Designing Software is a full package that creates different types of ID cards as well as Gate Pass for visitors when they arrive. You can start designing ID Cards using "Start With Template" option or "Start by Using Wizard" option. 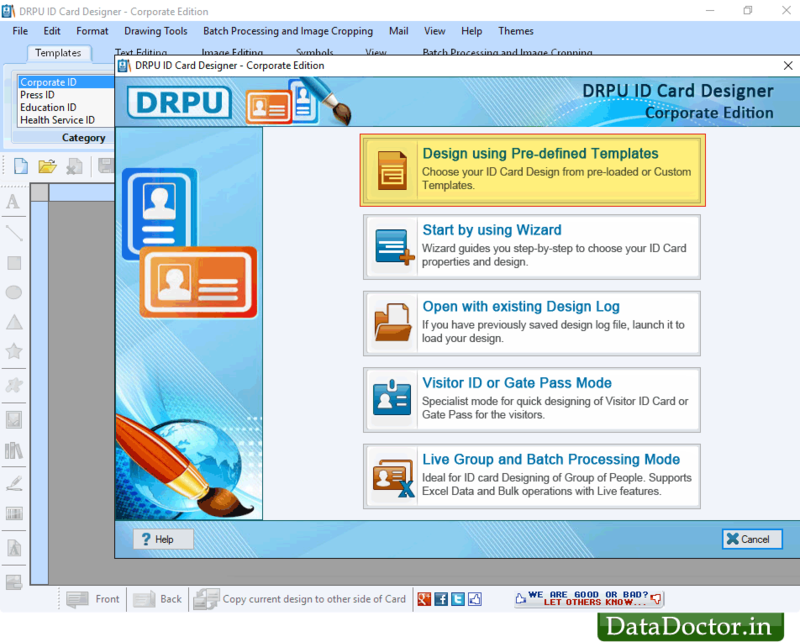 Software enables you to create log file to save generated ID card for future reference. Software is having 5 modules for designing ID card. You can choose any module as per your choice. For demonstration purpose, here we have selected "Design using Pre-defined Templates" module. ✓ Software is having inbuilt E-mail setting feature to send designed ID cards at specified email address. ✓ Provides option to save your ID cards in different file formats like JPEG, PDF, BMP etc. ✓ Software provides option to save your ID card designed log for future reference. ✓ You can Export your designed ID card as Image (JPEG, PNG etc. ), as PDF and as Template. ✓ Print designed ID cards using advanced print setting option. Software supports all types of printers for printing ID cards. ✓ Allows user to design ID card with "One (Front Side)" or "Two (Front & Back Side)" option as per requirement.